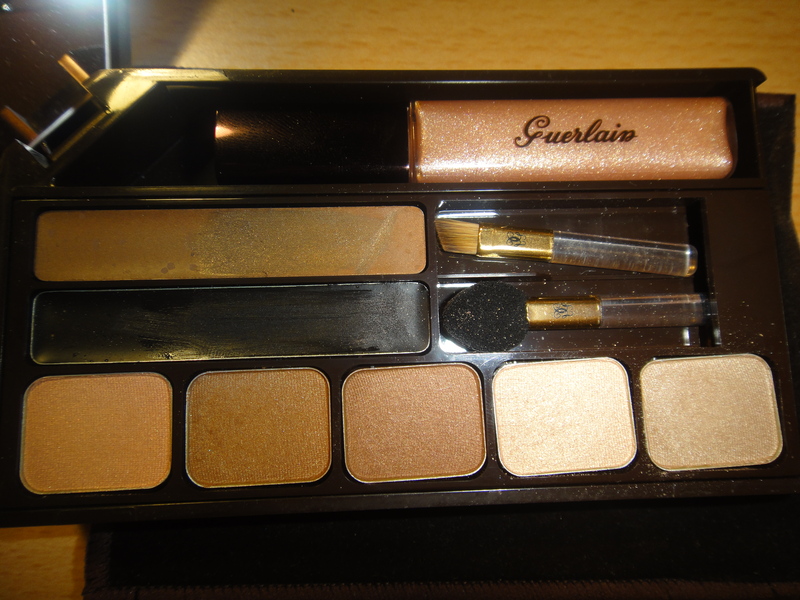 In this post, I will show you two Guerlain Terracotta palettes available exclusively through Duty Free, worldwide. Each costs approximately 246 Dhs. or else 47 Euro and I discovered them in Duty Free Dubai. The Guerlain Terracotta products are the perfect companion for summer vacations, as they give perfect glow to sun-kissed and deep tanned skin. Each of them comes in a velvet pouch. 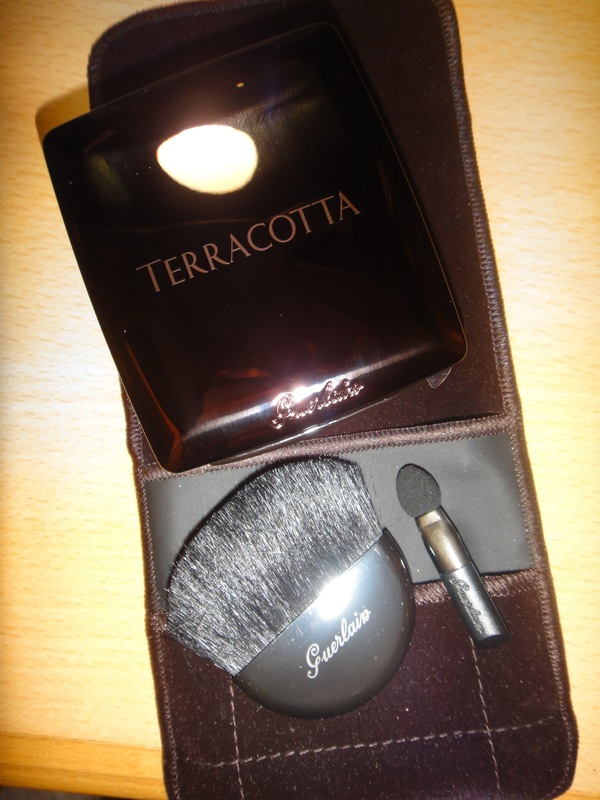 Terracotta “La selection de l’ete” palette comes with a mini sponge eye brush and a large, handy powder/ bronzer brush. 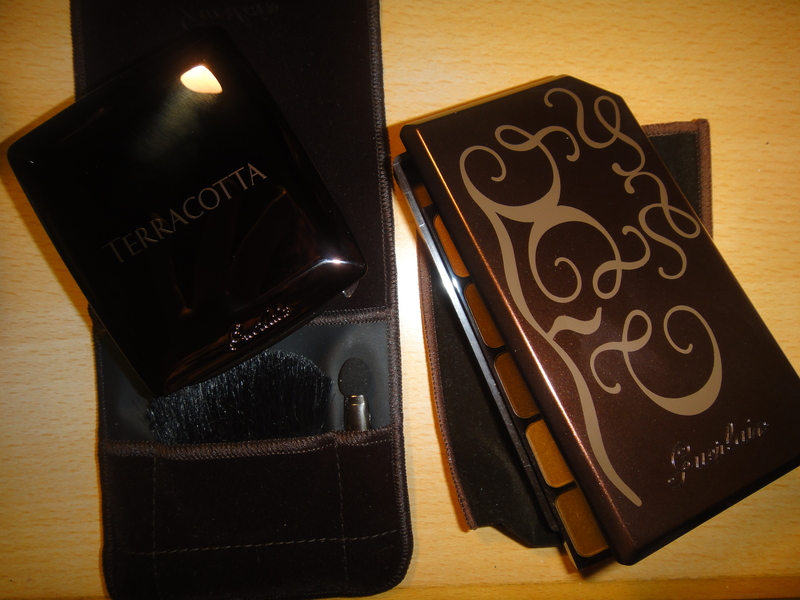 The first compartment of “La selection de l’ete” has a powder and a small stripe or bronzer. Both are slightly shimmery, they have the typical scent of Guerlain and they remind of Guelrain’s Sublime Radiant powder, which will be launched this summer as part of the “Inca” collection. The lightest shade adds radiance and warmth to the skin and can be even used for contour if your skintone is darker than nc/nw20. The shades basically, give us the chance to customize our personal shadesof bronzer all summer long, specially when we start the vacations being pale but as the summer goes we get tanner and tanner. 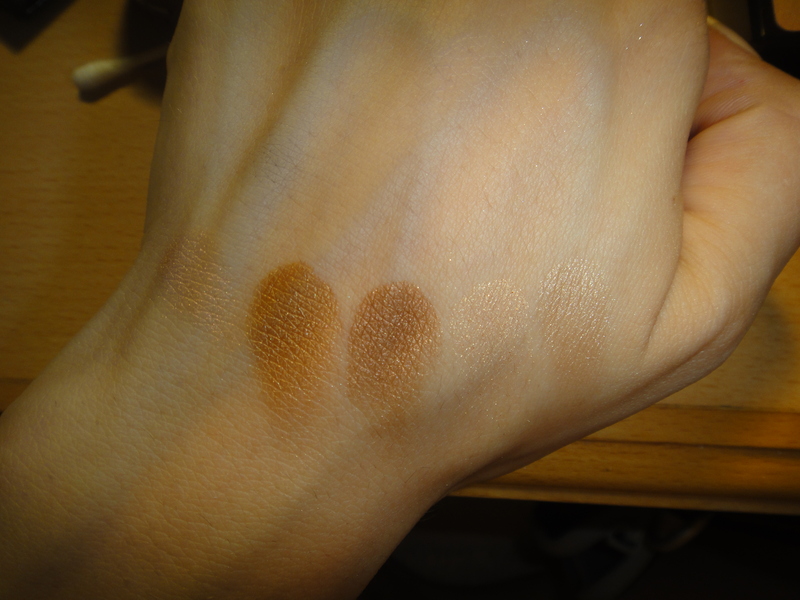 Up left is the swatch for the lightest shade, down left is the shade of the bronzer and on the right side is a mixture of the two shades. Thumbs up for the mirror included. 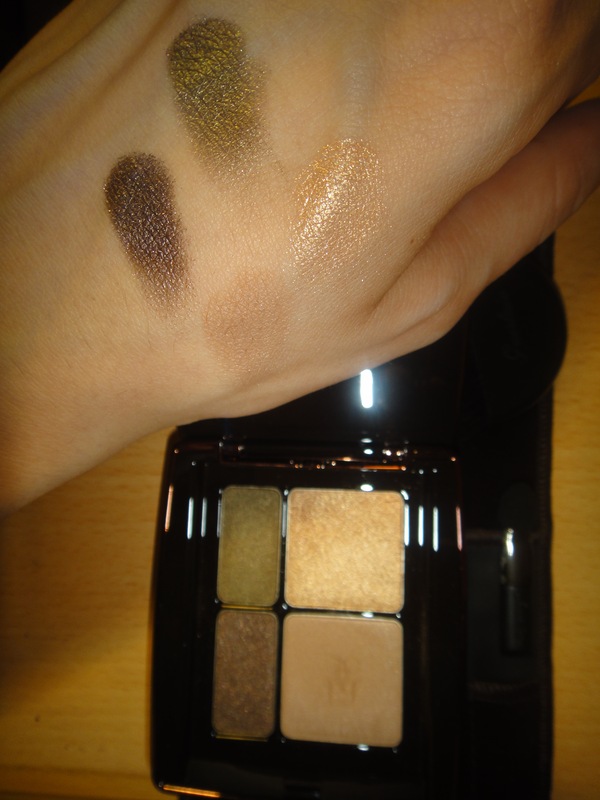 The second compartment of “La selection de l’ete” includes 4 eye shadows. From right to left, clockwise there are: a frosty and pale peachy-golden, a velvety taupe, a shimmery cool dark brown with plum undertones and a shimmery forest green with golden undertones. 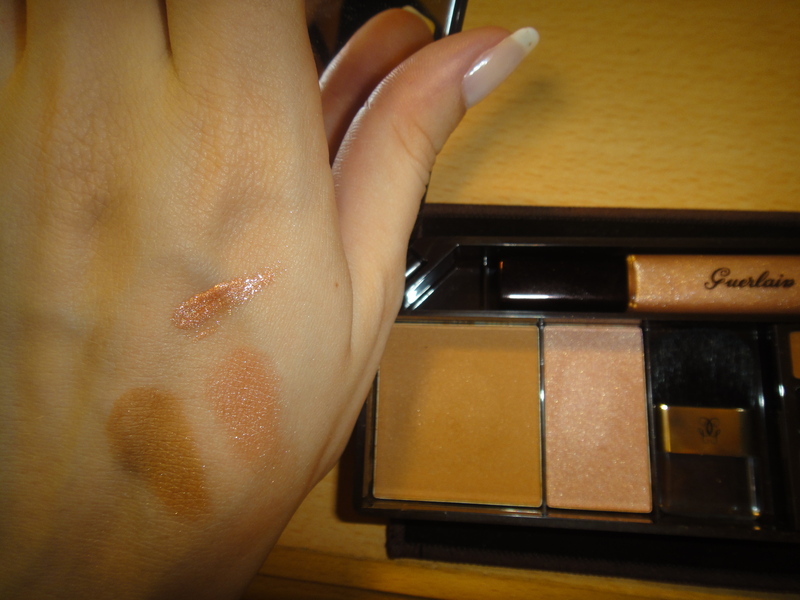 Thumbs up for excellent pigmentation and great colours selection. Here is your palette, for soft morning to loud and dramatic night looks. Terracotta make up palette has the most peculiar opening I have ever seen! Basically as soon as you drag the first compartment-drawer which includes all your eye make up, there is another section revealed to you, including your bronzer, blush and a mini blush brush. Add to that the enormous mirror, which serves as lid of the palette. Creative and playful…LOVE IT! 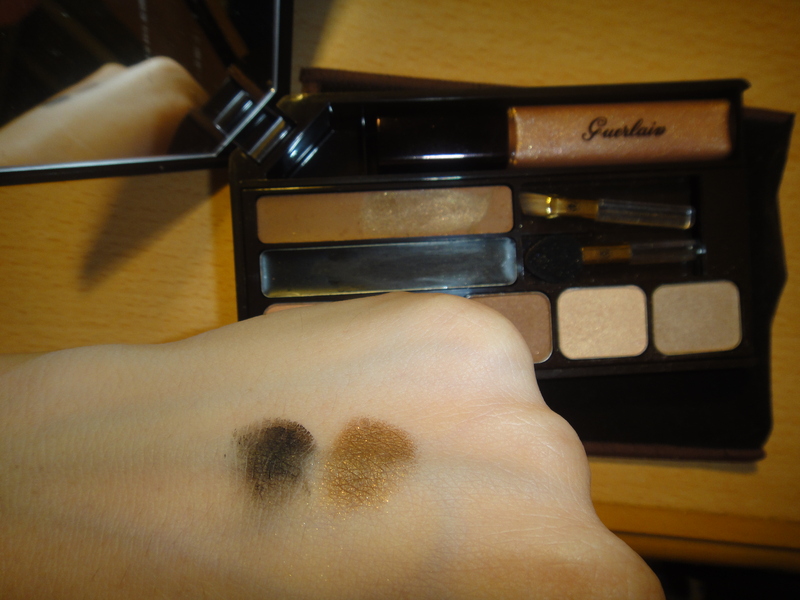 In the left, you can see the bronzer which is matte, long-lasting, perfect and if I am not mistaken it is from the basic line of Guerlain’s bronzing powders. 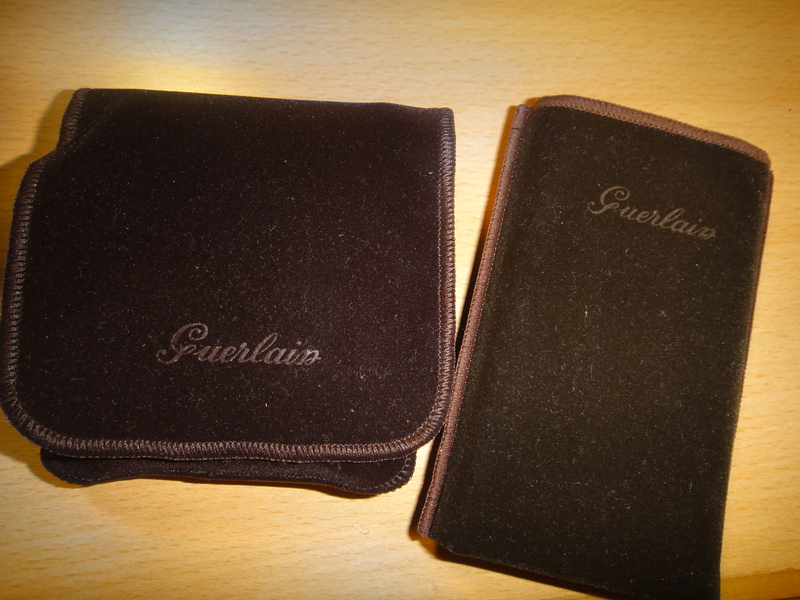 Once more, the bronzer has the typical violet-y scent, as most of Guerlain’s make up products do. 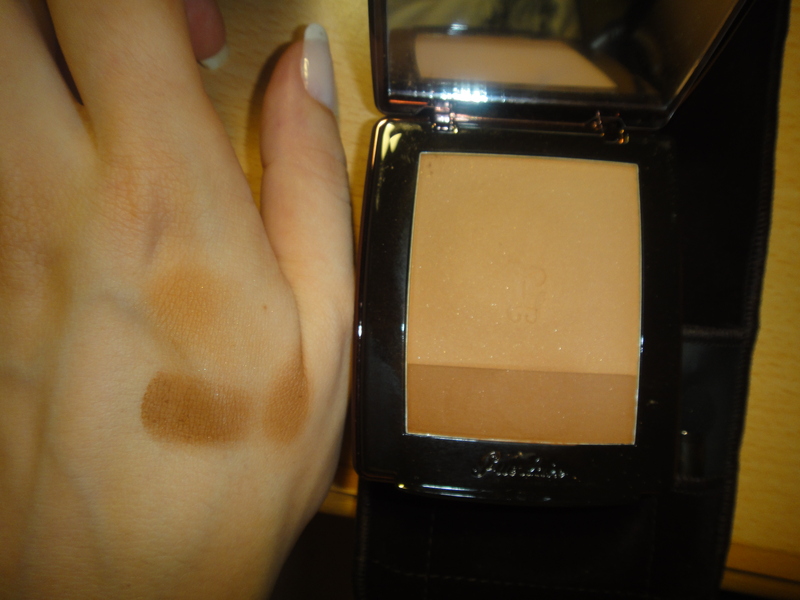 Then in the right you will see the blush, which gives you a nice, fresh, healthy looking cheek and you can build. Above the powders you can see the gloss swatch. The gloss is the -now discontinued and replaced by new Terracotta glosses- Beige Sun no52. The gloss has a frosty finish and goes nicely with tan. The kit also includes 2 gel eyeliners; a soft black and a clear taupe with golden undertones. 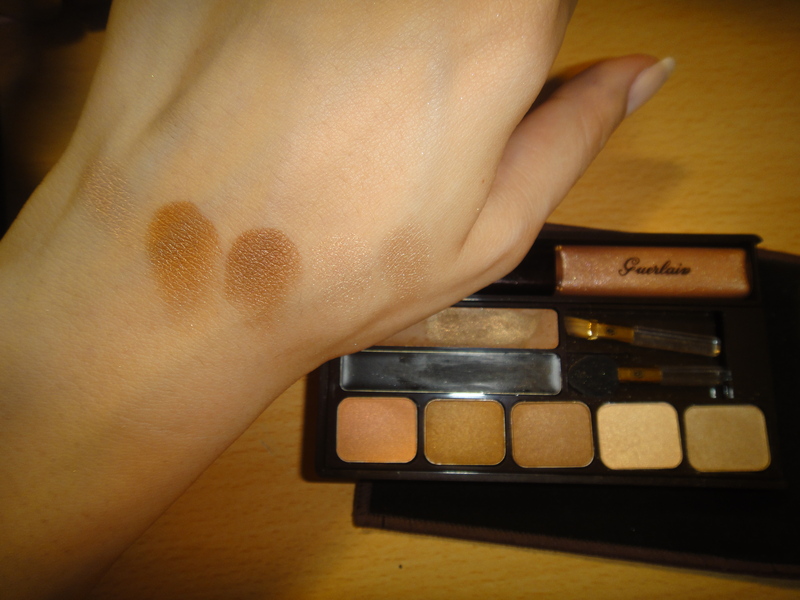 Both eyeliners have tiny golden flecks, which are hard to notice when worn. The eyeliners have poor staying power in the waterline and they are barely noticeable when worn in the up lashline. However they work perfectly as primer/base under eye shadows. The kit has a small angled brush which is supposed to work with the liners, but for me is hard to use due to the short hand. Here are the swatches of the eyeshadows. Most of them are sheer, but the finish is frosty/velvet and the texture is like butter. From left to right, there is a sheer peachy with peachy -pink shimmer, a brown with yellow-orange undertones, a medium brown with golden shimmer, a sheer light beige with barely noticeable pink shimmer and a cool sheer light taupe. The kit comes with a mini sponge brush as well. 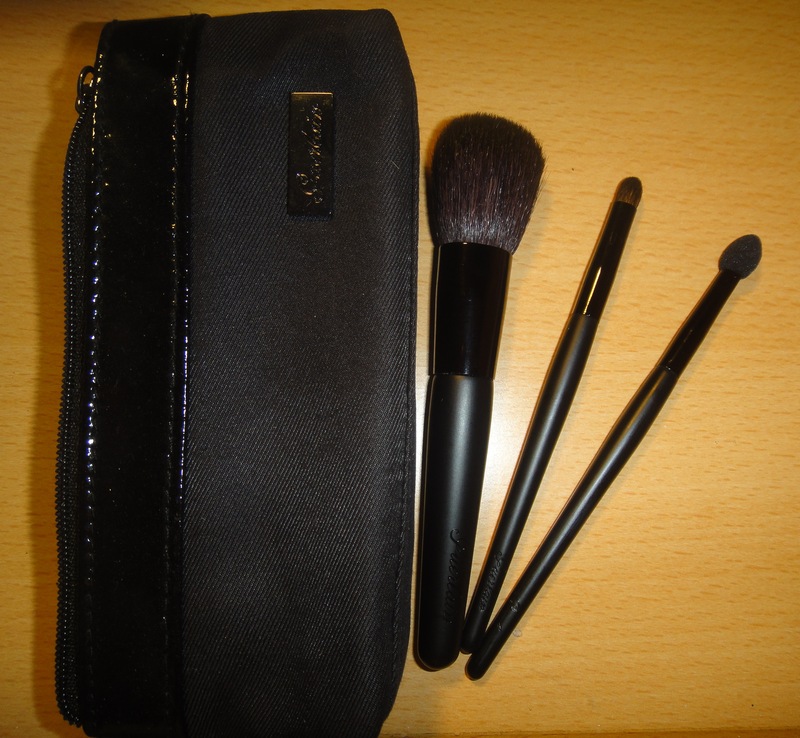 A sleek black pouch with 3 travel sized brushes, was the complimentary gift I received for my purchases! The brushes were: a very soft blush brush, a small smugger brush, great for smoking liners and shadows and a sponge brush for intense application of eye shadows. Do you enjoy shopping at Duty Free? This entry was tagged Bronzer, guerlain, make up, Summer, Vacations. Bookmark the permalink.